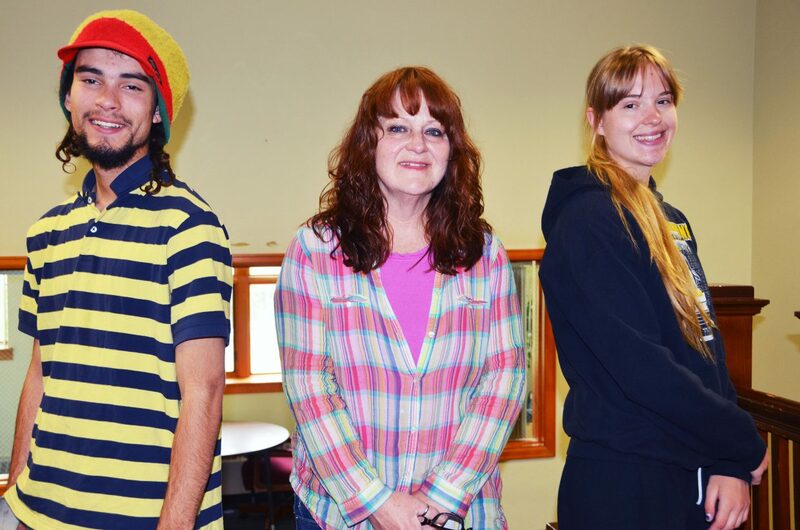 Joy Tegtman, center, is the instructor of Moffat County School District's alternative school. The school enables students with alternative goals and plans to get their diploma. Trey Choice, left, and Laurel Tegtman, right, are both juniors who are graduating in 2014, a year earlier than planned. Among the 100-plus graduating from Moffat County High School this year are six students who have earned their diploma by taking a different path than the usual one. Instead of heading to the school building five days a week from 8 a.m. to 3 p.m., this group took advantage of the opportunity to get a cap and gown through the school’s Y.E.S. Alternative Education Program, which allows students to do their learning online. The members of the class of 2014 who used this Alternative Program are as varied in their studies and backgrounds as those who are graduating by following the typical path. The alternative program, taught with a curriculum from Apex Learning, is there for students with a variety of needs. Some students there have fallen behind and need a way to earn their missing credits at a different pace, while others take advantage of Y.E.S. to push through faster. Laurel Tegtman and Thorin Jackson are both graduating a year early by using the alternative school to get through the low number of credits they needed to finish high school. Y.E.S. is helpful for students whose schedule doesn’t make seven hours of school five days a week easy, too. Secia Corball has a young child, but is graduating because the alternative school allows for more flexibility. Other students fell behind for other reasons, but with a classroom to show up to each day and the opportunity to learn a curriculum at the pace they choose, Moffat County High School has members of the Class of 2014 who wouldn’t be there otherwise.